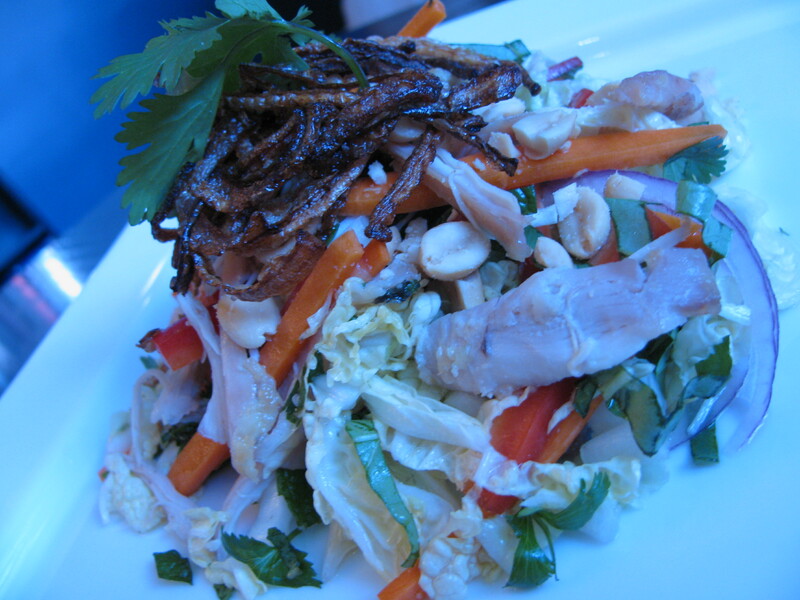 One of my favorite meals in Waikiki was a Vietnamese Chicken Salad. We found this incredible dish in a little hole-in-the-wall restaurant around the corner from the hotel we I stayed in. I’ve been craving this ever since, so I was especially excited to visit a local Vietnamese restaurant in Chicago recently. What a disappointment! The flavors were totally off not to mention the mess of a bone-in, skin on, boiled chicken they threw on top. Needless to say, I didn’t eat much of it. So with cravings in tact, I set out to replicate the spectacular salad served to me in Oahu. After much research and a few tries, I present to you my version of Goi Ga! It’s not exactly traditional but all the flavors are there and I think the roast chicken adds a little something extra. Enjoy!! Cut the carrots and bell pepper into match sticks. Cut the cabbage into thin (1/8 inch) strips and roughly chop the herbs. In a large bowl, whisk together the remaining fish sauce, lime juice, brown sugar, ginger and garlic. Place in the fridge to chill. Note: This dressing can be covered and kept for up to 1 month in the fridge. Lightly crush the peanuts and reserve for dressing. Place the marinated chicken on a baking sheet and roast for 20 – 25 minutes or until it’s cooked through. Cool for 5 minutes. While the chicken cools, combine the cabbage, herbs, onion, pepper and carrot in a very large bowl. Shred the chicken and add to the bowl with the cabbage. Add the dressing and toss to combine all the ingredients. Top with a bit of peanuts and a bit of cilantro. A sprinkling of fried onions or shallots is also traditional. Regular cabbage is traditional so if you can’t find Nappa Cabbage use regular cabbage. The traditional way to prepare the chicken is steamed or boiled. If you don’t have time or resources to marinate and roast the chicken then just toss it in a pot with 6 cups of water and boil the bird! Then shred it and use as directed. I love to see the variety of foods you offer. Vietnamese food is a favorite of mine, I might be a little biased though. I am eager to try this dish of yours. You have all the right ingredients. The large amount of skin and bone you were served with is what very traditional Vietnamese like to eat. More modern Viet’s have adjusted somewhat to less skin or no skin like in Pho ga (chicken soup); It’s the bones and skin that is coveted. When I make Pho ga, I do it skinless and boneless. And the family love it! Fantastic post Ali. And the photo looks amazing! ni and tasty asian salad, i would love it even more with a little of tamarind paste within the dressing…..
That’s a great idea! I’ll absolutely try that next time.